Next up are nem nuong, or Vietnamese meatballs. If I could only eat one cuisine for the rest of my life, I think it would be Vietnamese. These flavor-packed morsels of porky yumminess show up in a variety of Vietnamese dishes, including pho soup, bahn mi sandwiches, nem nuong cuon (rice rolls), and bun cha hanoi, probably one of the best dishes of all time, consisting of grilled pork, these meat patties, savory dipping broth/sauce, rice noodles and piles of herbs. 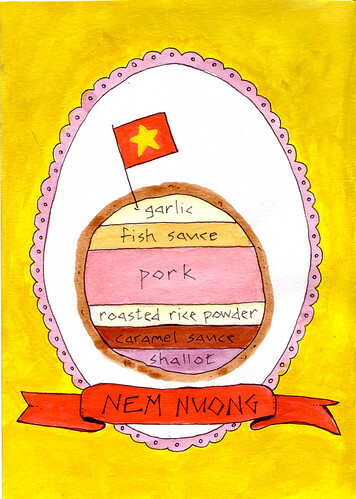 There's a great recipe in Pleasures of the Vietnamese Table, as well as here and here.